Haunted Castle is a turn-based game for two to six players. 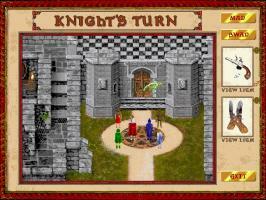 It is not an adventure game, though it does contain some elements of a quest type adventure. Players have to guide their chosen Hero through the Haunted Castle in a race to find a key to either the Gold or Silver Room, where they collect a treasure. They have then to escape from the castle with their treasures, and the first one out is the winner. The six Heroes have different attributes to help in the quest: the Knight wears protective armour, the Wizard can teleport, the Gypsy can foresee danger, the Dwarf can walk through walls, the Elf can run faster than the others, and the Fairy can fly. A complete game can be played in under an hour, and because the set-up of each new game is randomised, it can be re-played as often as you wish. It is an ideal game for a family to share. 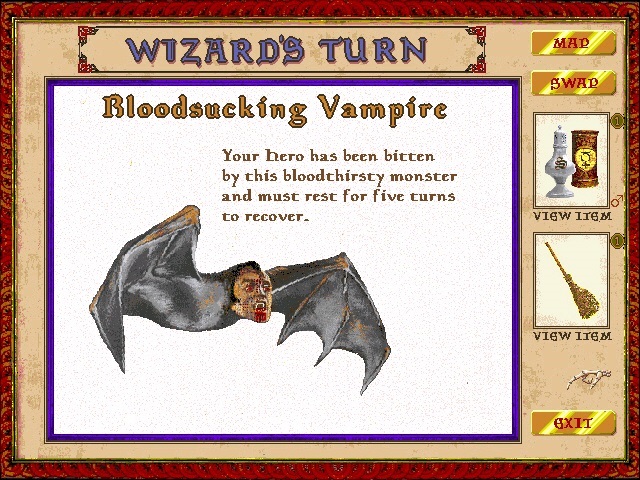 Details of how to play the game are included in the game, and there is also a User Introduction document with more details. "Really solid board game with a spooky medieval setting, 6 unique characters, fun graphics and definite replay value. The music is great, but a little repetitive as you keep swapping between players. A single player mode with AI is a lot to ask, but would have been the icing on this clever cake." The 30-40 years of development on this game really show. I found the six characters in the game, and all the items, and threats etc. to be very well balanced. It seems any character has a pretty much equal chance to win if the player uses that character's special abilities wisely. An interesting board game made in AGS. Graphics and music are lovely, mechanics are simple to understand and the game is fun to play. It is a pity there is no AI, so grab some friend and try this with them!